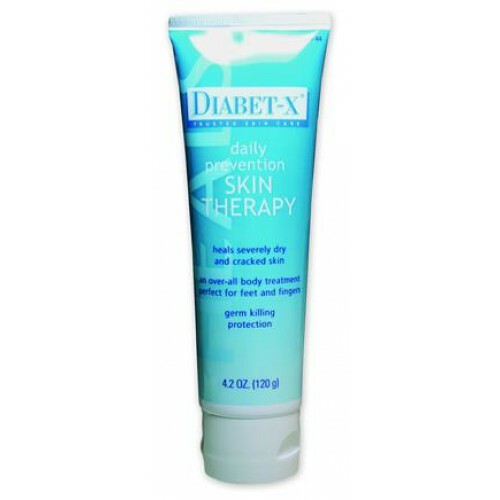 Diabet-X Skin Therapy BUY Diabetic Skin Cream, Daily Prevention Therapy Cream, 40104, Fungal Cream. Diabet-X Skin Therapy is prevention therapy cream that is doctor tested and safe for daily use. Diabet-X® is antimicrobial and contains 10% Urea. Enriched with Aloe Vera, Diabet-X comes in a 4 ounce tube. Gentle, natural ingredients make it safe for daily use. To prevent infections before they begin, the formulation containing Triclosan has been shown to be effective in eliminating the very microorganisms that cause skin irritation, fungal colonization, bacterial infections and tissue breakdown. Antibacterial dry skin trea™ ent. Excellent for use on the entire body, between the toes, on the heel and the entire foot to deeply moisturize the skin and help prevent infection. Designed for serious skin conditions. Diabet-X Skin Therapy is ideal for use with people with diabetes, Lymphedema, those on dialysis, or any one with extremely dry skin. When used daily, the rich blend of vitamins A, D and E, aloe vera, urea, and allantoin rehydrates, exfoliates and soothes dry, red, calloused skin while enhancing the body’s natural ability to regenerate cells and maintain healthy tissue. Ideal for use between the toe and folds of the skin and under the breasts. After reading other reviews I decided to give this cream a try - and I'm glad I did! It has definitely helped the dry skin on my feet and ankles, and I've only been using it a little over a week. I Purchase this cream for my son and He has told Me it has improve His dry skin problem. This cream is incredible. Works so well for my father who is 93 and diabetic. Leaves skin so soft and prevents the redness on the sides of his feet from poor circulation. My husband suffers from diabetes and has severe circulatory problems in his legs. Without cream, his legs develop large areas of sloughing skin. Diabet-X has proven to be remarkable and keeps his skin soft and without ulcers. He has been using Diabet-X for two years and his doctor is very pleased. The cost of the cream is half of what it is on some other sites, and shipping is inexpensive and very fast. I don't have a long history with the cream, but it has a pleasant smell and doesn't feel too greasy . I have only used this product for a month. Previously I was using Callex and prior to that Centraphil. I have diabetes and peripheral neuropathy due to exposure to Agent Orange. Of the three products I have used I have to give Diabeti-X top rating. My feet are not as chapped as they were under the previous creams I was using. I have also found the prices here the lowest of any place including shipping. I highly recommend this product. Using Diabeti-X I have noticed more relief now in the evening as compared to the other creams. Shipped within one day. Cheapest price I could find for the cream I love!!! Thank you!